“All good drinks burn on their way down, right?” –Me. Between coughs and gasps for air. I still remember the very first time I made a spicy margarita. I dropped some sliced, fresh jalapeños in tequila. And then I walked away. For like a week. The peppers were insanely spicy. The tequila was… What’s a good word for “insanely &^%$#@! hot?” That. 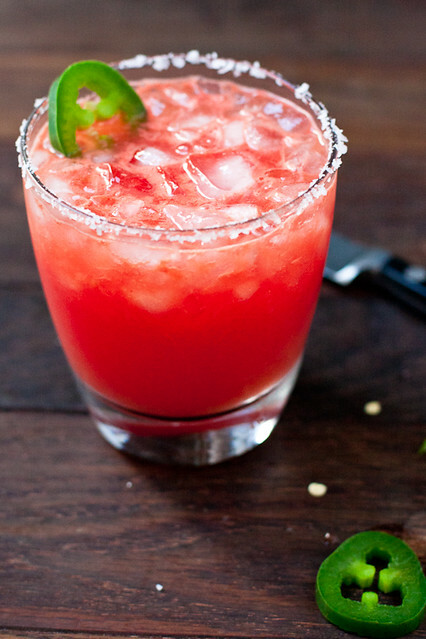 For these spicy watermelon margaritas, ice cold watermelon cubes are blended and strained for the juice, mixed with homemade margarita mix, spiked with some homemade jalapeño tequila, and served over crushed ice in a salt-rimmed glass. Because everyone knows that salt and watermelon go together like… chocolate and peanut butter. Rachel and Ross. Peyton and Omaha. 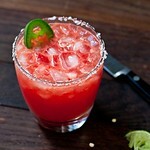 Fresh watermelon is blended with a homemade jalapeño tequila for a spicy and refreshing margarita. Place the watermelon cubes in a blender and process for ~1 minute until smooth. Pour through a strainer and discard the solids - you should have 1 cup of juice. In a small pitcher, mix the watermelon juice with the homemade margarita mix and orange liqueur. Add the tequila and reserve the jalapeño slices, stirring to mix well. 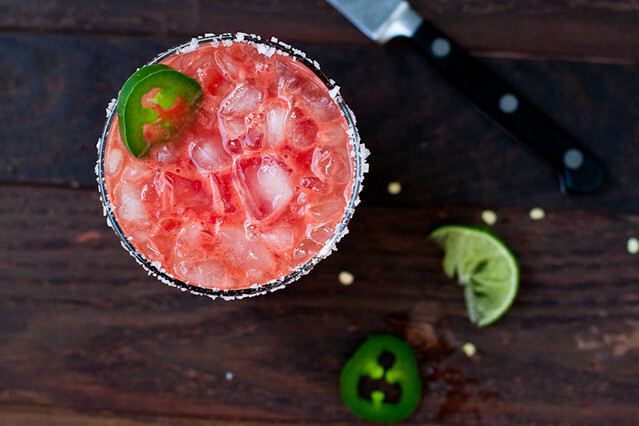 Fill salt-rimmed glasses with ice and serve, garnishing each margarita with a tequila-soaked slice of jalapeño. These sound yummy! I don’t usually like “heat” in my adult beverages but this sounds like a delicious pairing! Pinned! Omg, I did the same thing you did, except with habaneros…and we soaked them for a MONTH. The resulting tequila was 100% undrinkable and is (for some reason) still in the back of my fridge…ugh. Just dilute it with regular tequila. Or add a drop of it to things. 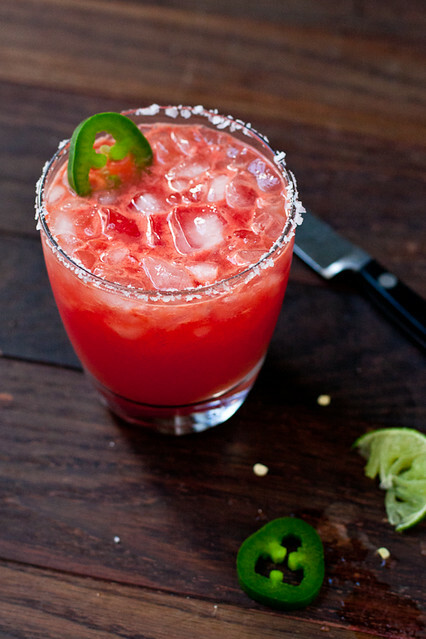 This is an absolutely perfect margarita, love this so much! I had a crazy spicy margarita just this past week and totally thought of you! You could see the red pepper scattered throughout. It was awesome. Probably not as awesome as this will be. Perfect mix of sweet, refreshing and spicy! Totally making these tomorrow night for a bbq birthday party! Thanks so much. I made a batch of these last week, and I probably let my jalapenos steep for a bit too long because they were HOT! But they were still so, so good! I think jalapeno tequila will be my new go-to for margaritas! YUM!